Do you remember your algebra? The Grange equals price greater than its value and taste. For all the hype I've read and heard lately, I was sorely disappointed in what I got for a bill of $102 (without tip). It's been six months since The Citizen Hotel and The Grange opened. In that time they have been able to work through any early learning curves with service and timing. I certainly have no complaint on service. The staff were all very pleasant and enthusiastic as well as attentive. My disappointment lay with the food. As I've read in reviews and articles, the server explained that the menu changes daily because the chef focuses on locally grown, seasonal produce and meats. On this day there was nothing strikingly different on the menu. 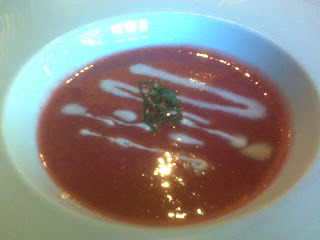 A new item was the chilled strawberry/rhubarb soup. I'm not a fan of chilled soups in general, but decided I wanted to give this one a try. It was light and refreshing with a swirl of creme fraiche and a bit of chopped mint. I enjoyed it, but wondered on having a smoothie as a soup course. I ordered the duck breast. It arrived on a bed of faro and wilted spinach. Everything was cooked well, but there was no seasoning or flavor popping out. I found it all pretty bland and the duck meat a bit tough. After I finished the dish I requested the menu again so that I could review the description. 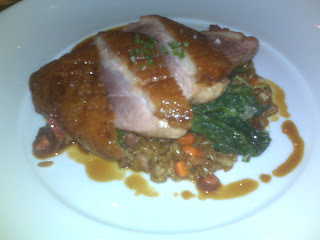 It mentioned the breast, the faro, the spinach, and then a strawberry/rhubarb gastrique. There had been only two bites that I had any of that. And I enjoyed those bites because the sweetness complimented the duck meat (and why duck is often paired with cherries, oranges, or other fruit). Someone had been extremely frugal on putting that on my plate. You can't even see any in the photo. 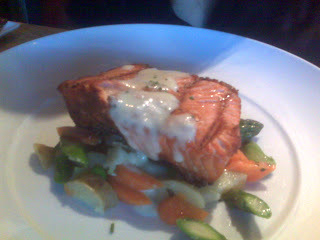 My roommate had ordered the salmon which arrived, as you see above, over a bed of steamed vegetables and an aioli. She was confused because she had seen the word 'salad' on her item. Again we referred to the menu where the description said salmon with a spring vegetable salad. To her that conjured an image of some leafy spring greens, not steamed vegetables. As for the salmon and aioli, she found them to be pretty simple and regular for a price of $32. Considering the large piece of salmon, it could have used more than the trickle of aioli you see above. 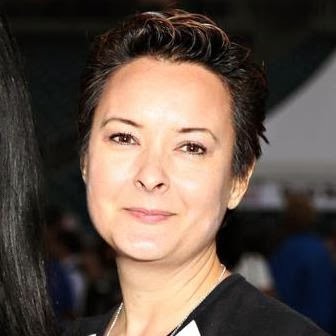 We both felt that when you eat out at an upscale place such as this that you want to have food that you would not prepare for yourself at home because of complexity or originality. As we reviewed the rest of the entrees listed we decided that all of them were pretty simple. The meats were basically grilled and then plated with some rather plain sides. So am I paying the high price purely because the stuff is organic and grown locally? Because it certainly isn't for any strikingly special treatment of the dishes. (Afterthought: Recently the Paragary's group has been doing three courses for $20 at their restaurants. Interestingly they all ran the same low cost items - salmon and chicken as the two entree options. So if salmon is a cheap meal to make, why does Grange charge $32 - even if it is a larger piece and line caught wild salmon. Still don't see what we got as justifying $32.) The desserts did show more creativity and I had to pick between three items that caught my eye. 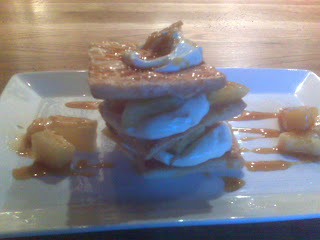 I figured I would stick to my Napoleon comparison and order their version with honey pineapple sauce. It was artfully presented with the puff layers all askew. It was not bad, but the puff squares were too thick and dense and difficult to cut through. There could have been more cream as well. The pineapple was fresh and sweetened with a bit of honey. Good, but not great for $9. As you can tell, we were disappointed with the value of our meal. We did have two cocktails on the bill as well, which brought the total to $102. For that amount of money I would appreciate more flavor and complexity than what I got. 8/11/09 update It's always good to give a place a second chance. Last night I had a much better meal at The Grange. Our meal started off with a salmon tartare made with fresh, raw salmon, avocado, a soy-ginger sauce, and cilantro. I had expectations of thin slices of raw salmon drizzled with the sauce. Instead we got the above mixture of chopped salmon and avocado set in shape with a mold. The whole thing was very flavorful and fresh, although there was one citrusy flavor note that I just couldn't place that was a little too strong for me. We still ate it all up though. The Grange has been written about a lot and one article went on about how they are serving goat. Goat, it turns out, is one of the trendy ingredients of the moment. No matter that cultures such as African, Hispanic, and Middle Eastern have been eating goat for centuries. I saw that it was one of the featured entrees this night and selected the goat shank and loin with goat cheese fondue and spicy pepperonata. As you see, the dish was split in two. On the left was not a shank, but rather a couple of ribs that had just been roasted. This side of the plate was very disappointing. First of all, it was a struggle to get any meat off of the bones. Certainly it could not be done in a proper, delicate manner with knife and fork. It was demanding finger picking action. I decided to pass. After all, besides the struggle, it just wasn't all that tasty and worth the effort. The pepperonata underneath was nice enough, but I ended up eating it with the other side of the plate. The loin on the right was a hit flavorwise. I don't know how one would properly describe goat-taste, but I suppose if you like lamb (which I love) then you know you'll be OK with goat. The goat cheese fondue was naturally a perfect compliment and nice and creamy. My complaint with this side was that the meat was tough. Isn't loin supposed to be one of the most tender cuts or an animal? My date ordered the ribeye with mushroom ragout. He received a nice sized steak which he enjoyed. Careful to scrape off the offending mushrooms, he offered me a few pieces and I must say, it was the best tasting beef I've had in a long time. So full of flavor. I did note that it was really leaning to the rare side of medium rare and there was quite a bit of fat that my date was trimming off. But again, the flavor was fantastic. We had watched with amusement as the couple beside us had ordered three desserts. The amusement came from the lovely panna cotta. Play the video and see why. I've never seen a better jiggle in my life. My date couldn't resist ordering it himself and we were definitely pleased with how light and delicious it was. I wanted something new and different and so I selected the chevre tart. It arrived at a nice warm temperature so that the goat cheese was so smooth and creamy. It was a generous size too. Both of us agreed that dessert was our favorite course. The Grange certainly did much better this time around. Our total dinner bill this time came to $118 but at least I felt more comfortable about getting what I had paid for.